Violation: Kentucky Wildcats fans rioted in the streets. Explanation: Rioting lends credence to the longtime, seemingly rhetorical question: If everybody else jumped off a bridge, would you? 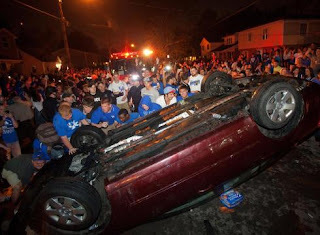 Kentucky fans flooded the streets after the team's Final Four game against the Louisville Cardinals. The raucous night included 39 total fires (including a car fire), 27 arrests, and thousands of imbeciles. Oh, and by the way, Kentucky won the game. And they were heavily favored to win said game. You would assume that the school with the most all-time NCAA basketball victories would know how to act like they've been there before, but I guess that would require them to think first. And after all the burnt and roasted couches up and down State Street, the fans clearly value stupidity over the problem of having nowhere to sit in their own houses. Punishment: Aside from making your town look like a bunch of boneheaded morons, I'm hoping the basketball gods condemn you further with an upset loss versus Kansas in the championship game tonight. Or at least that's the way it's written up in my bracket, so Rock, Chalk, J Mok. it was a rivalry game ... i agree that its no excuse but in Lexington, thats all you have to root for. A win against your most hated rival and making it back to the ship for first time since 1998.